Last weekend, my husband's baseball team played in the grand final. His club had four teams in the grand final, the women's team and men's A grade, B grade and C grade. So for the occasion I did myself up in team colours. 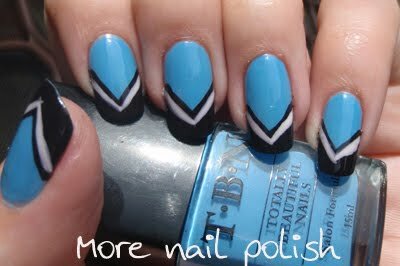 The base was Totally Beautiful Nails in Neon Blue. I then added some wobbly chevron lines using Ulta3 black satin. Then a white nail art pen for the lines. So how did they go, well not only did my husbands A grade team lose, but so did every other team!! And his team was minor premiers too, only losing a few games all year!! FAIL! So I went straight home and took off my loser nails! I like them! I don't think there loser nails! This post made me lol. For loser nails they're pretty damn hot.